Due to the accessible nature of crowd-funding, online streaming and affordable film production tools we now live in an age where any fan with the right crew and resources can make a Star Trek movie of their very own. But are the final products worth watching? This week hosts Cam Smith and Tyler Orton take a deep dive into this strange new world, and offer their thoughts on the latest highly-publicized effort, Star Trek: Renegades, as well as engage in a broader discussion on the merits, limitations and common flaws that frequently pop up in these creative endeavors. 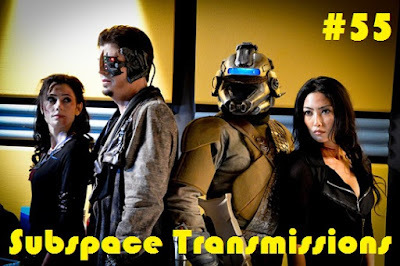 Over the course of an in-depth journey of discovery and occasional appreciation, they also touch upon Axanar, Of Gods and Men and Star Trek Continues, and strive to make peace with the concept of non-canon entertainment. Wanna appear on the show? Shoot us a 30 to 60-second audio clip telling us your thoughts on STAR TREK: RENEGADES OR FAN FILMS IN GENERAL and you could take the spotlight in an upcoming program! You can also send any other questions, topic ideas or feedback to subspacetransmissionspod@gmail.com! Let me preface this by saying I am no way affiliated with RENEGADES or any other fan film so I have no pony in this race. This was the first time I have listened to your podcast as I wanted to listen to a review of this film and compare it to my own impressions. Some points I agreed on and other I didn't. Thank you for sharing your thoughts....with that said.. your presentation has a lot to be desired ...you guys came off as a pair of smirking A-holes in your derision of this and other fan efforts. Having heard you for the first time I couldn't believe how pompous you came off sounding.